Preheat the oven to 180C or 160C if you have a fan oven. Line a cupcake tin or individual tins with 12 paper cases. Make sure your butter (or dairy free alternative) is soft. Place the vanilla cake mix, butter (or dairy free alternative), eggs and water into a large bowl. Mix to a smooth consistency by hand, or you can beat together with an electric whisk for 15 seconds. Stop, scrape down the bowl and mix for a further 10 seconds. Divide the mixture between the cupcake cases, filling to three quarters full. Bake for 18-20 minutes until risen and springy to the touch. Leave to cool in their tin for around 3 minutes before lifting out and leaving to cool completely. In a large bowl, beat the butter or dairy free alternative with a spatula or whisk until it’s soft and smooth. Sift in half the icing sugar and mix well until combined. Sift over the remaining icing sugar and mix well, adding the milk or dairy free alternative as required to create a soft spreadable icing. Beat well to make it light and fluffy. 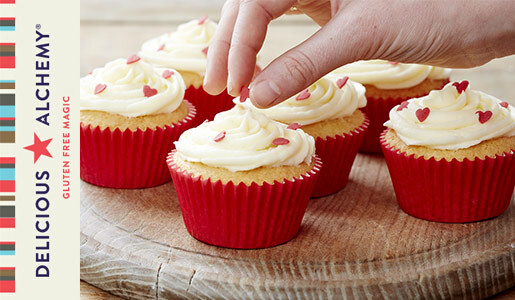 Spread on with a knife, or spoon the icing into a piping bag fitted with a large star or plain nozzle. Pipe swirls of icing onto the top of your cooled cupcakes. Decorate your cupcakes as desired! Next story What’s In Your Soap? Previous story Birch Water, the New Super Drink!